Successfully Added Mini WiFi Camera - 10MP CMOS, 720p HD Footage, 150-Degree Angle, Motion Detection, Rotating Magnetic Base, 5m Night Vision to your Shopping Cart. This WiFi mini camera is a cool gizmo that is can be used perfectly as a mini IP camera or webcam. With its magnetic and rotating base, this miniature camera can be easily attached to any surface. Once in place, you’ll be able to aim it in any imaginable direction to make sure you’ll get the best view at all times. With its CMOS sensor, this mini IP camera produces crisp video with a 720p resolution. Therefore, it lets you enjoy clear visuals and high details that bring forth recognizable images. Thanks to its mini and portable design, you’ll be able to easily detach it and install it at a different location whenever necessary. With its 150-degree lens, this mini IP camera covers a wide angle. This means that your security camera is capable of capturing all that’s happening in your room without leaving any dead spots. Therefore, you can be guaranteed that nothing will stay uncaptured with this mini IP camera. 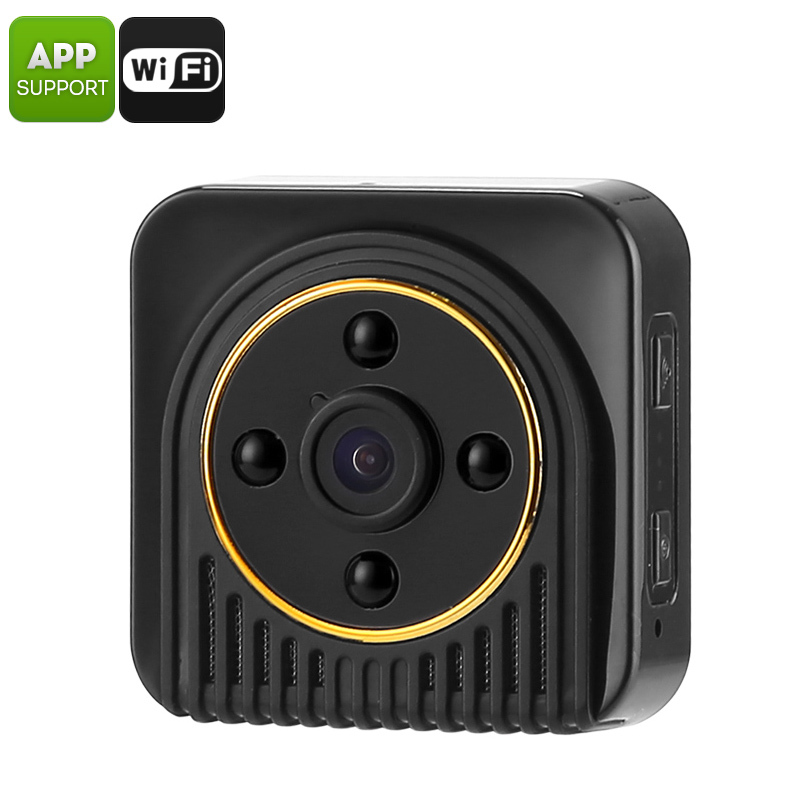 Thanks to its 20m wireless WiFi support, you will be able to easily connect this IP camera with your iOS or Android phone. When used with the dedicated mobile application, you can shoot video and snap pictures remotely. Additionally, it comes with a mini SD card slot to store your previously snapped photos and footage. A built-in 600mAh battery treats you with up to 2.5 hours of usage time. This means that you’ll be able to use your WiFi IP camera even when it is not connected to a power supply. Thanks to this feature, this mini camera brings along great possibilities for using it as a webcam or for simply shooting HD video with friends and family. It even supports 5m night vision. Therefore, you’ll be able to shoot stunning 720p HD video at both day and night.